Dincer capes and gowns are designed for maximum performance and easy usability in the professional barber and hairdresser industry. This is one of the key attributes that make these capes & gowns the number one choice for the professional Barber & Hairdresser. Professional Hair Cutting Gown. This Cape is made from soft, lightweight, waterproof material keeping clothes clean from hair and dry from water. Perfect for hair cutting, colouring and perming. Velcro Neck closure for easy fit/removal. If you are a barber, stylist, or salon beautician, this is the product for you. AceLife Premium Threading Capes are far superior to other barber capes on the market. Color of Cape: Black. We are based in NYC, in the heart of the FASHION DISTRICT! LEATHER BARBER APRONS. Made of High Quality PU LEATHER. BLACK Color. These Aprons are HAND MADE for Perfect Balance and Best Performance. For Wholesale Prices. Product Specifications. 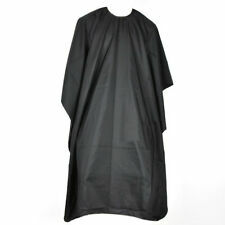 UNISEX ADULTS BLACK HAIR SALON HAIRDRESSING CUTTING CAPE COVER BARBERS GOWN. Condition is New. Dispatched with Royal Mail 2nd Class. AGENDA SALON ETHOS NEOPRENE COLLAR CAPE. Fits comfortably with high quality poppers. Made from soft and lightweight nylon. View Our Categories. GREEN CAMO BAPE. Dincer capes and gowns are designed for maximum performance and easy usability in the professional barber and hairdresser industry. This is one of the key attributes that make these capes & gowns the number one choice for the professional Barber & Hairdresser. Barber Haircutting Jacket is made from anti-static, durable material. Jacket has 2 big front pockets wherein you can keep brush, scissors or any accessories and one pocket on upper left side. XL : Width 59cm, Length 73 cm. Barber hair cutting and styling cape. Professional Leather Hairdressing Barber Apron Cape for Barber Hairstylist. LEATHER BARBER APRONS. Made of High Quality PU LEATHER. BLACK Color. These Aprons are HAND MADE for Perfect Balance and Best Performance. 1 Wahl Black Cutting Gown. LEATHER BARBER APRONS. Made of High Quality PU LEATHER. These Aprons are HAND MADE for Perfect Balance and Best Performance. For Wholesale Prices. Size: Length: 28.5" (73.5 cm), Width: 24" (61 cm). BLACK HAIRDRESSING HAIR STYLIST or MAKE UP ARTIST COLOUR / TINTING APRON. EDUCATION QUALITY 100% 'SOFT FEEL', DURABLE & LIGHTWEIGHT, WATER & CHEMICAL RESISTANT POLYESTER. TEFLON COATED - FOR FULL WATER & CHEMICAL RESISTANCE. 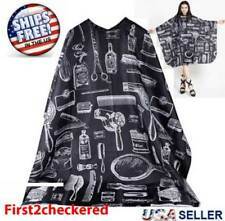 Barber Shop Capes Gowns Hair Cutting Premium Apron Gown Cape Salons Hairdressing. Condition is New. Dispatched with Royal Mail 1st Class. Barber Shop Cape Gown Premium Satin Salon Hairdresser Capes Gowns Red Black. Condition is New. Dispatched with Royal Mail 2nd Class. 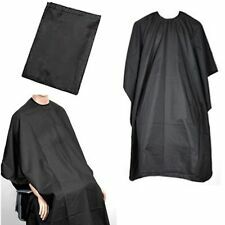 Hair Cutting Cape Pro Salon Hairdressing Hairdresser Gown Barber Cloth Apron New. Condition is New. Dispatched with Royal Mail 2nd Class. Old Fashion Hair cutting barber cape. Black & White stripes. Traditional Style. 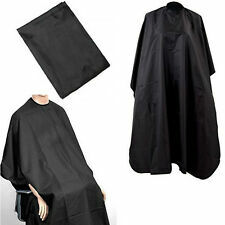 Barber Capes Gowns Tools Barber Pole Salon Premium Haircutting Cape Gown. Condition is New. Dispatched with Royal Mail 1st Class. 'SALON PROFESSIONAL' HIGH QUALITY 100%'SOFT FEEL' NYLON. THIS MATERIAL ISTOP SALON PRO QUALITY - SOFT SHEEN FINISH & HIGH QUALITY 'SOFT FEEL' CRINKLE NYLON MATERIAL. THIS ISNOT MADE FROM LOW COST POLYESTER - POLYESTER CAUSES STATIC! 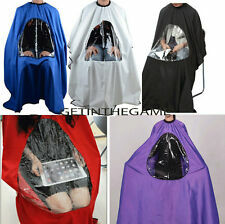 Hair Cutting Cape Salon Hairdressing Hairdresser Gown Barber Waterproof 160x140. Condition is New. Dispatched with Royal Mail 2nd Class. Friseurumhang mit Nadelstreifen für Herrenfriseure. Traditionelles Nadelstreifen-Desgin in schwarz-weiß. Weiter Halsausschnitt mit komfortablem und flexiblem Hakenverschluss. 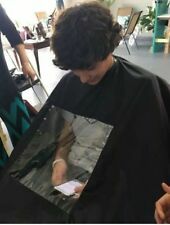 BARBER CAPE. Pinstripe Cape. 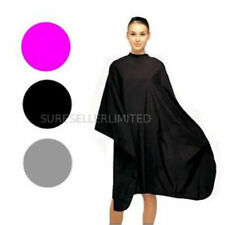 1 Solid Black Adult Salon Hair Cut Hairdressing Barbers Hairdresser Cape Gown Waterproof Cloth Anti-Dirt Capes. The cape have waterproof function. 1 X Hair Cutting Gown. Suitable for hairdressing, hair dye, perm and more. Multi Pockets To Keep Your Tools In. Premium Quality Hand Made.